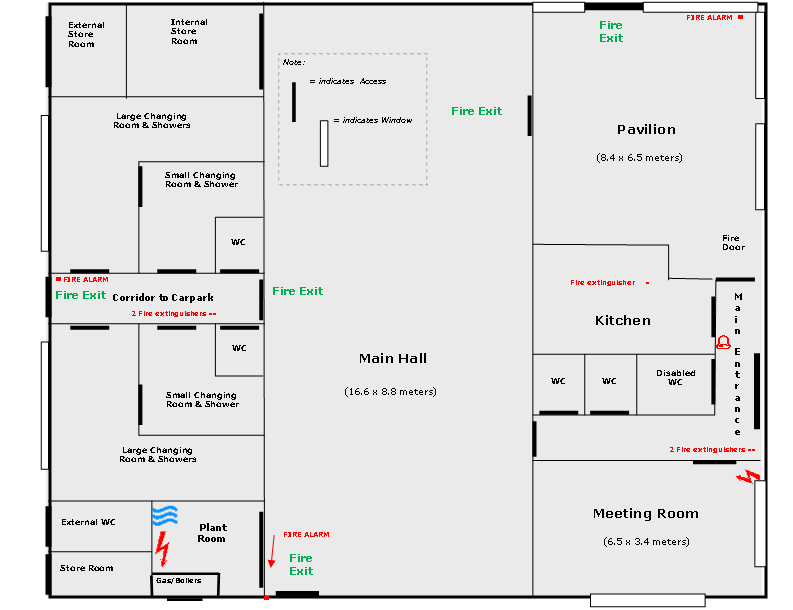 The Nigel Poulton Community Hall comprises the following areas. The Main Hall was designed as a multipurpose sports-hall, although it can cater for a large range of other uses. The floor is covered with a special material which has a cushioning effect that is ideal for sporting activities. This is currently marked out with a full-size Badminton court, which is in regular use. A lockable internal store room is available to accommodate sports equipment. Roll-down carpeting material is located at one end of the hall for protecting the floor and making it available for other non-sporting activities and gatherings. Parties, including bouncy castles and team games, etc. This room has windows on 2 of its sides giving ample natural light. Blinds are fitted to both windows to give shade and/or privacy as required. The room serves two primary functions. As a private location for small group-gatherings such as committee meetings, ad hoc meetings, discussion groups, educational classes, etc. The room contains a ‘conference table’ around which eleven people can be seated in comfort and a restricted number of additional chairs can be accommodated as necessary. 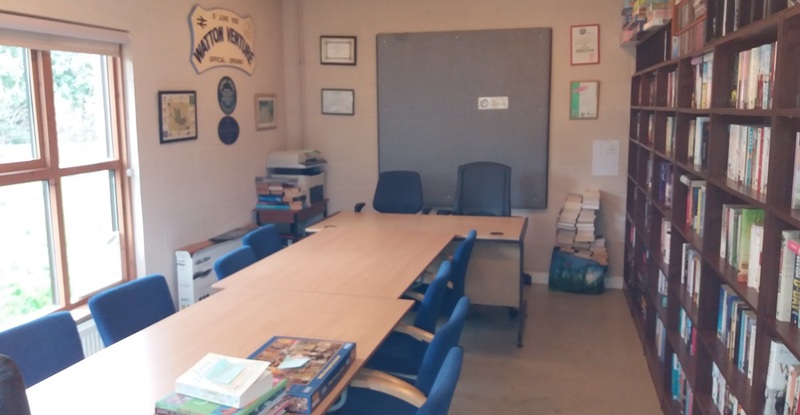 This is the room in which the Parish Council holds its monthly meetings and sub-committee meetings; all of which are open to the Public. Our MP also uses the Meeting Room for his surgeries. As a small Public-Library to enable residents to continue to borrow books in the absence of the Mobile-Library service which was withdrawn by HCC due to budgetary cuts. 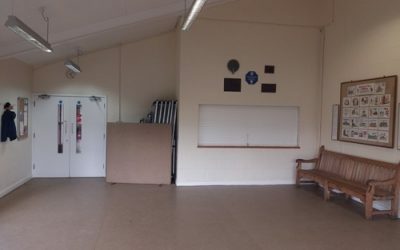 The Pavilion is a very comfortable space and is an ideal location in which to host a range of activities and gatherings; examples of which include children’s parties, Youth Club, Public meetings, large group-meetings, club sessions, weight-watchers, etc. 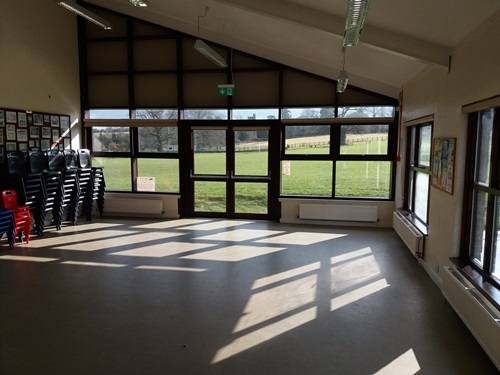 Two sides of the Pavilion have large windows which, in addition to giving excellent natural light, provide an unparalleled view of the sports field and the surrounding area. Like the Meeting Room, blinds are fitted to all of the windows to provide shade and ensure privacy when required. 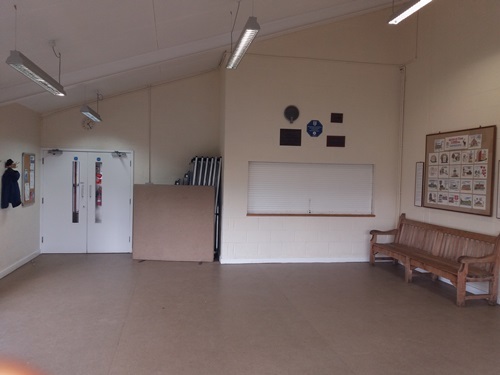 Double-doors provide direct access onto the sports field from the Pavilion, which is ideal on hot sunny days (do you remember those?) during children’s parties or when the Cricket Club uses it for teas on match-days. Chairs and tables are readily available within the Pavilion. The well-equipped and spacious kitchen offers the opportunity to serve refreshments directly to people within the Pavilion. If required, the kitchen can be isolated from the Pavilion by closing the large servicing-hatch between the two areas. There are 2 large, bright and spacious changing rooms (‘home’ and ‘away’), each comprising a ‘team-shower’ facility. Naturally the shower-heads can be used on an individual basis. 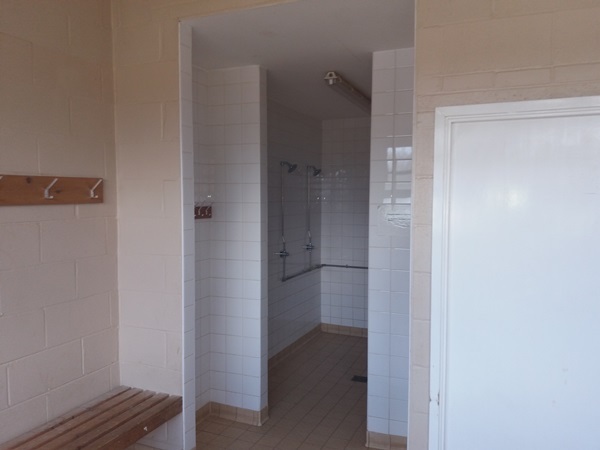 In addition, there is also a pair of smaller self-contained changing rooms, each of which comprises a single shower and accommodation for up to 4 people. The small changing rooms each have a private access or can be reached via a door to the associated larger changing room. 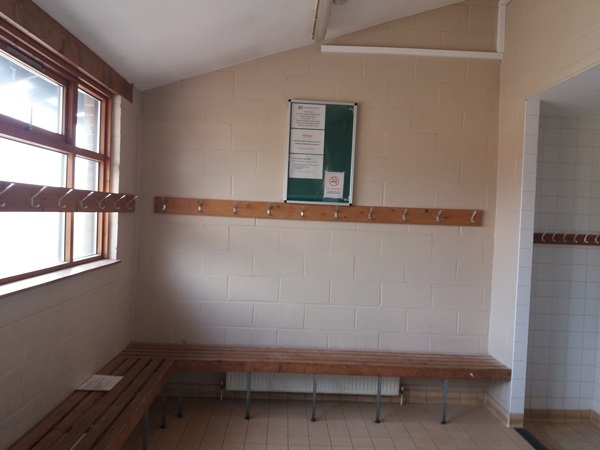 Access to the changing rooms is via the car-park, which in turn gives direct access to the sports field. 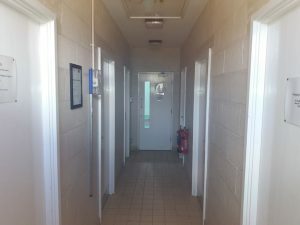 There are 2 toilets (Male and Female) on the Changing-Rooms side of the building and can also be accesed from the Main Hall. 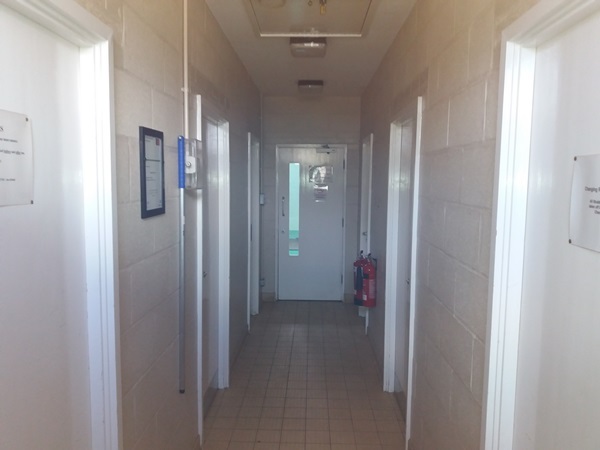 There are also 2 toilets (Male and Female) on the Pavilion/Meeting Room side of the building and these too can be accesed from the Main Hall. A Disabled Toilet is available directly opposite to the main entrance of the building. 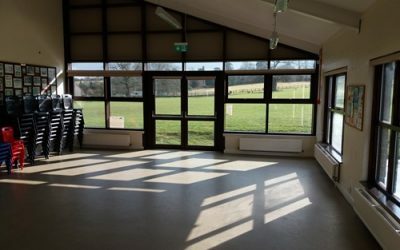 This facility is available to the public and, although locked in the evenings, is provided as a convenience for those using the sports field, play area and Tennis Courts, and for anyone else who needs them.